Catch gloves come in four different sizes: senior, intermediate, junior and youth. Use the recommendations below as a guide in finding the glove size that is right for you. To determine your hand length, measure from the heel of the palm to the tip of the middle finger. Make sure you know which hand you catch with. Of course, this isn’t too much of an issue when buying gloves in a store, but it is necessary to specify this information when ordering online or over the phone. Regular Catch Gloves are worn on the LEFT hand. Full Right Catch Gloves are worn on the RIGHT hand. When choosing a catch glove, the most important consideration is to make sure that the goalie can actually close the glove. To do this, the goalie’s fingers need to wrap far enough around the break of the glove to give him/her enough leverage to close the glove properly. As a guideline, we recommend that there be no more than 1/2 inch of space between the tip of the goalie’s finger and the end of the finger stall in the catch glove. Adults with stronger hands can get away with having a bit more space in the finger stalls, but kids aged 13 and under should keep to this guide as much as possible. To determine if the glove fits, open the backhand portion of the glove and determine goalie’s finger position in the stalls. 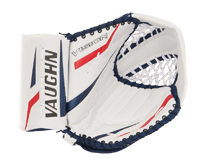 Too often, young goalies choose gloves that have a larger catching surface than they need with the thought that a big glove is like a big basket – the bigger the glove, the more pucks will find their way into it. Unknowing parents, though well meaning, oftentimes choose larger catch gloves with the idea that the child will “grow into it” or will “get used to it once it has broken in”. Smaller gloves, especially for beginners, are easier to close and therefore easier to use. Smaller hands cannot wrap around the palm break of larger gloves, and if the glove can’t be closed, the puck can’t be caught. Larger gloves are often too heavy for the young goalie. If the goalie can’t lift the glove, then chances are he/she won’t catch the puck. The wrist straps on larger gloves are often too big to keep the glove snug around the goalie’s wrist. When this is the case, harder shots often pull the glove off of the goalie’s hand upon impact. To use a baseball analogy, youth goalies should look to purchase a smaller second baseman’s mitt rather than a larger outfielder’s glove. Pure Hockey carries a wide variety of catch gloves, and rarely will you find two gloves that fit the same way. With this in mind, it’s good for the goalie to have an idea of what he or she likes in a glove before purchasing. And, while many of these choices ultimately come down to personal preference, we’ve taken the time here to describe the different features of a catch glove so that you can make the most informed buying decision possible. Higher or “90 degree” Break: generally close like you are making a thumbs-up sign, with the tips of the fingers trying to touch the heel of the hand. Lower or “60 degree” Break: Closing gloves of this type feels like closing the tips of your fingers to the tip of your thumb. Gloves of this type generally close more like your typical baseball glove would close. 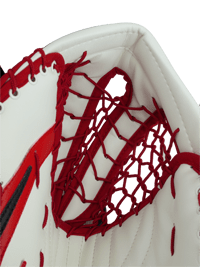 Blocking Cuff: Like blockers, catch gloves often have curves for the same purpose as the blocker: to deflect pucks and ramp them away from you and the goal net. The location of the curve varies on catch gloves. Some curves are found at the bottom of the glove (by your forearm) and others are found at the side (by your thumb). Some gloves have curves at both of these locations. There are a variety of curve options because different goalies hold their gloves in different ways depending on their stance. Additionally, today’s manufacturers are making both “One-Piece” and “Two-Piece” blocking cuffs. “One-Piece” cuffs have no break between the cuff and the palm/thumb area of the glove. By eliminating the break, the blocking surface of the glove is more rigid and therefore the rebound direction is more predictable. “Two-Piece” cuffs feature a break between the cuff and the palm/thumb area of the glove. The break gives the glove more flexibility at the wrist, which is great for goalies who like to shoot and pass the puck often. Most of the catch gloves on the market today are two-piece gloves. Single T pockets feature a larger, single T-Shaped web that provides the structural support to the pocket. 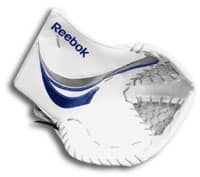 They are more traditional in feel, and the impact of the puck against the T can be felt throughout the entire glove allowing the goalie to know when the puck is in the pocket. Double T pockets feature two smaller, leather support pieces that run from the top of the T to the base of the pocket. The two pieces are laced together, and sometimes the lacing between the two has enough slack in it to allow the pocket to expand a bit deeper once the puck hits it. In theory, the Double-T has the ability to stop the rotation of the puck at impact, helping to keep the puck in the pocket more often. Catch Glove pockets are laced with either a traditional nylon lacing, or, more recently, cotton skate laces. Both work well in providing structural support to the pocket. Cotton skate laces, however, have a bit more give to them and may aid in keeping the puck in the pocket at impact. Additionally, gloves also come with internal wrist and hand straps for extra support on the glove hand. It is important to have an adjustable strap for your wrist inside the glove. 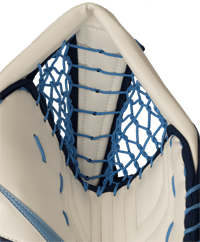 Some goalies wear these straps tight while others wear them loose, but this extra support not only helps keep the glove on your hand but also allows better control when catching and shooting the puck. Only bake catch gloves in skate ovens, as they circulate the heated air evenly over the glove. Heat the glove in an accurately controlled CONVECTION oven (aka Skate Bake oven) at a temperature of 145 to 160 degrees for 8 to 10 minutes. Caution – the glove will be hot! If necessary, allow the glove to cool slightly before putting in on the hand. Once heated, put the glove on and tighten the wrist strap, thumb and finger loops. Flex the glove repeatedly to form to the desired shape. The inside of the glove can be misted with water to help soften the interior, speed up the break-in process and keep the materials cool to the touch. This process may be repeated if necessary. Hair Dryer Method: Works much the same as the "baking" method does, as you are applying heat to the break area of the glove at both the glove face and the glove interior. Make sure to keep the hair dryer on medium heat, and keep it moving over the surface. Be careful not to apply direct heat to one area of the glove for prolonged periods of time! Patience and constant motion work best when using this method. Once the glove is warm, put your hand inside and flex repeatedly.